Nephthys, or “Mistress of the House,” was the goddess of the air (since the sky is the “head” of the world) and the head of the family. She also sometimes represented Lower Egypt along with Ptah-Tanen. In Egyptian mythology, Nephthys was the daughter of Geb (Earth) and Nut (sky) and the sister of Isis. She was Seth’s sister and wife and was the mother of Anubis, although in some myths Nephthys was barren. Therefore, she was associated with vultures, a bird which the Egyptians believed could not have children, and with mourning. Nephthys helped Isis bring Osiris back to life after he was killed by Seth, so she is often depicted in tombs and on coffins as a protector of the dead, specifically associated with the organs placed in canopic jars. Nephthys and Isis look very similar and can only be differentiated by their headdresses. Nephthys is shown with a basket on her head, however she is also sometimes depicted as a hawk or a mourning woman. 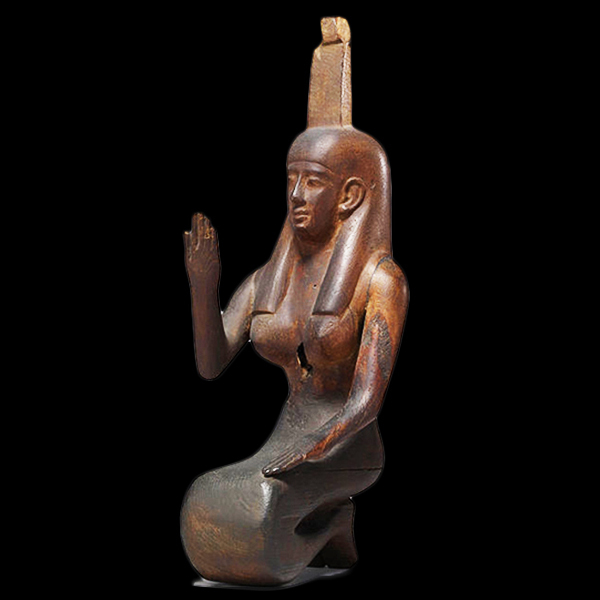 Image: Nephthys statue at the Walters Art Museum in Baltimore.